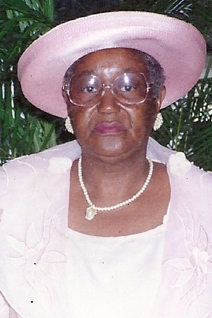 Funeral Service for the late Gwendolyn Elizabeth Daley age 87 years of Garden View Road will be held on Friday August 10th, 2018 at 11:00 a.m. at St. Margaret’s Anglican Church. Officiating will be Fr. Oswald Pinder assisted by other ministers of the Clergy. Interment will follow in Lakeview Memorial Gardens, John F. Kennedy Drive. Left to cherish her memories are her Husband: Noel Edward Daley Sr.; Six daughters (and spouses): Marva, Michelle Sears (Joshua), Sonia, Arlene Hutchinson (Leslie), Laverne Symonette (Winston), Kakalina Yvonne; Four sons: Keith (Vernita), Noel Jr., George, Tracy (Monique); Aunt: Belle Styles; Sister-in-law: Mavis Adderley and Family; Grandchildren (and spouses): Petra, Charitee (Carlos Paris), Sasha, Adawn Symonette, Khandra, Kirsti (Darvin Johnson), Kharin (Frederick Arnett), Mikhail Sears, Marcus Devon Daley, Uralee Johnson, Britt Burnside, Tristan Daley, Deshaun Daley, Iesha Shepherd, Aaron Daley, Aleah Hutchinson; Great-grandchildren: Ahmir LaFleur, Derryn Michelle Johnson, Shania Pierre, Tenyshia Symonette, Kendria Atkinson, Jett Rashaun Paris; Cousins: Carl Butler of Miami, Florida, Jenny Edwards, Eloise Johnson (Ulric) and family; Yvonne Campbell and family, Lionel Styles and family; Jan Styles and family, Sherry Gomez and family, Joyanne Edwards of Norman Oklahoma and family, David Knowles and family; Nieces and Nephews: Cecelia, Enoch, Stephen, Andy, Rosten, Roosevelt, Veronica, Shannica, Valerie, Antonio, Ashwood, Marcia, Albert, Shawn, Willard Jr., Michael Munroe, Jennylee Rolle, Sabrina, Calvin, Remond, Nathaniel Munroe and family, Vesta Williams and family; Other relatives and friends: Ricardo Daley of Ewa Beach, Hawaii, and family, Christine Wring and family, Betty Mackey and family, Peter Bowe and family, Leonie Sweeting and family, Annie Bain and family, Melton Newbold and family, Bloneva Sears and family, Paula Roberts and family, Phycol Smith and family, Darnel Bosfield and family, Alvena Johnson and family, Daydawn Butler and family, Sylvia Mays and family, Patrice and Donald Symonette, Sharon Robinson and family, Cherrylee Pinder and family, Machelle Carroll and family, Ruth Francis and family, Reginald Wells and family, Sally Hutchinson and family, Antoinette Thompson and family, Asa Thompson and family, Sylvia Mackey and family, Alice Miller and family, Valerie Saunders and family, Karen Woodside and family, Patricia Demeritte, Raymond Clarke and family, the Duvalier family, the Cartwright family, the Curtis family, the Miller family, the Gibson family, the Roxbury family and the rest of the Garden View family; The Staff of the Ministry of Education, The Staff of Water & Sewerage Corporation, The Staff of CIBC First Caribbean International Bank, The Staff of CIBC Trust Company Bahamas Limited, The Staff of the Ministry of Agriculture; The Staff of Atlantis Casino, The Staff of Poseidon Restaurant; Staff of Albury-Sayles Primary School; Staff of T. A. Thompson Junior High School; Centreville Seventh Day Adventist Church Family; Staff of the Intensive Care Unit at Doctor’s Hospital; and other family and friends too numerous to mention; Special thanks to Reverend Fr. Oswald Pinder and Family, Reverend Fr. Roland Hamilton and Family, the Vestry and members of St. Margaret’s Church Family. Family and friends may pay their last respects at Bethel Brothers Morticians, #44 Nassau Street on Thursday from 10:00 a.m. to 6:00 p.m. and at the church on Friday from 10:00 a.m. until service time.